You are at:Home»Great Falls Montana»More Corn! Fall has arrived – woohoo! And that means it’s time for one of the funnest things to do in October – the Corn Maze near Vaughn! My favorite part is the Cow Train! 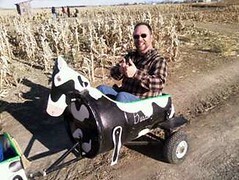 Here’s me in all my corny glory riding the Cow Train; more pix from our ’07 adventure. Here’s some details; visit the official website for more info. 2 miles west of Vaughn on Highway 89, turn north towards Sterling feedlot on the hill at the ITS AMAIZING sign.